As a pet mom focused on raising my pets naturally, I think about every product my pets contact. Toxins add up. What may start out as a small concern, adding that to other “small concerns” or multiplying by daily use can run quickly into problems and toxicity. When someone asks me what is the best cat litter, I have to say there is no ‘one size fits all.’ Is there ever? People often look for the best clumping cat litter, best cat litter for odor control, or even the best cat litter for multiple cats. Sure, these are all very helpful qualities in a good cat litter, but my first go-to is to look for the best natural cat litter. A cat litter that is safe for my cats. 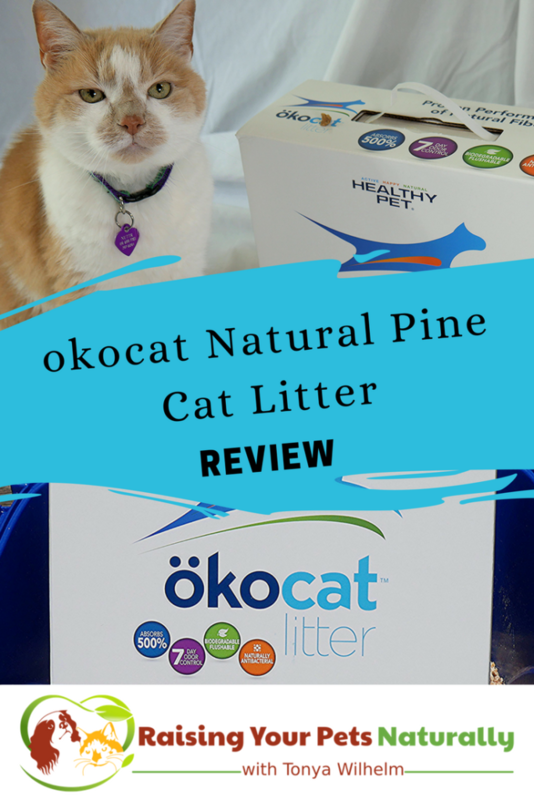 When I saw that one of the Chewy Influencer selections was okocat litter from Healthy Pet, I was excited to review their pine cat litter. Oko is the German word for ecological, meaning green or organic, and okocat litter is made from 100% natural wood or paper fiber. Personally, I’m not a fan of clay cat litter. Clay contains silica, which can cause lung disease and lung cancer. Clay is also a known carcinogen when inhaled. Think about all that dust (silica) that you and your cat are inhaling daily as he digs in his litter and you pour and scoop it. Clay also does not biodegrade, so it’s adding to the landfills. 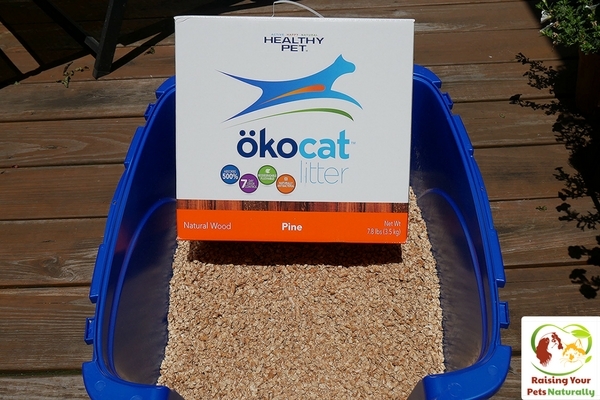 okocat’s natural pine cat litter, on the other hand, is naturally biodegradable. This cat litter is also dust-free and flushable, but I do not recommend flushing any cat litter down the toilet. The natural wood fiber binds and traps liquids and odors so they can’t escape. This is so important in our home. Sometimes other natural cat litters I have used smell like a barn. I’d still rather have a barn smell than toxins, but okocat litter does not have that barnyard smell. okocat natural wood pine cat litter is natural and does not smell like a barnyard, but does it work? A big yes for us! Nutter has HUGE pees. Maybe it’s the biologically appropriate cat food he receives, I don’t know. But okocat stood up to the challenge. I used one box in Nutter’s cat litter box and the bottom of the box was dry, which hasn’t always been the case with some cat litter. This natural cat litter does a great job of absorbing the urine and odor. If you are looking for a natural cat litter that offers great odor control, is dust-free, and good for multiple cats, check out okocat from Healthy Pet. Hop over to Chewy for 1-2 day free shipping on orders over $49! Do you try to avoid toxic chemicals and ingredients? Tell me in the comments. We’ve so far changed two cat litters and came up with one that best suits him and us in terms of smell and no toxicity. It’s really important for us to keep him away from “the bad” stuff! This brand seems great, I would definitely try it! I have an aunty who would love this post. She has 3 cats and always buy store branded cat litter. They usually do the job but the smell is not very nice. Plus for $49 she will be saving a lot of money! Thanks for sharing! I order from Chewy.com ALL the time! I just placed an order today. lol And okocat litter is amazing. Great post. We really need to stay informed about what we buy for our cats. I didn’t know clay contains silica, which can cause lung disease! Nutter is absolutely charming. I’m planning to adopt a kitty (hopefully my husband would let me) and I’ll definitely try this out. Thank you. Nutter is quite the old man. He was a stray 15 years ago! Good luck on the kitty hunt. My one cat uses Yesterday’s New kitty litter. The other uses plain old clay litter without any additives or scents. Thanks, Anosa. Being prepared prior is even better! Something that is natural, but also controls the odour would be a great selling point when it comes to litter. I don’t have a cat, but I do like that there is cat litter that is more natural. I used to have cats and hated the smell of the litter, so the fact that it is odor free is awesome too. Like I said, I don’t have cats now, but I have a friend who has a cat so I will pass this on to her. Thank you for this information. While I do not have cats, I’m about to get a puppy in few weeks. My husband and I are discussing about cat litter training. We will definitely consider this. Sure thing, Mei. You might want to check out my book, Proactive Puppy Care. 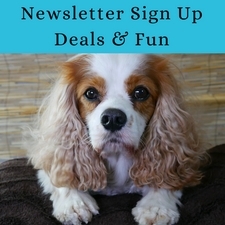 https://raisingyourpetsnaturally.com/naturalpetcarebooks Then, you can order all your puppy items on Chewy.com! This is quite informative and will share with my friends who have cats as it is always good to know what we are using with our cats. Thanks, Pooja. I appreciate the shares. okocat is an amazing cat litter and Chewy.com is the best online store! I don’t have a cat, but I have a family member who does. Sending her this article- it seems quite helpful! Thank you. Thanks, Samantha. I love getting the info out about great natural and effective brands and products. Our pets are counting on us. I need to check this out. My cat has a thyroid condition (so she urinates a lot more frequently) but the standard litter is such a hassle and gets all over the place. I’d love to have something that is more natural and healthier for all of us! Sweet kittie. Yes, especially if she’s already dealing with a medical issue that lowers the immune. Chemical free will be extra important for her. This is different, I’ve never thought about an all natural litter. One would hope the cat likes the litter as they can be very picky animals. I don’t have any cats but I love how there are natural substitutes out there ! 🙂 I too am loving how so many brands are offering such natural and effective solutions for our pets. I’m not a cat person but I am all about natural products for our animals, especially if the products need to be about in the home. Yes, we really want to consider what products we bring into our home and are using on a daily basis. Great tips for those that have a cat. I prefer dogs to cat. 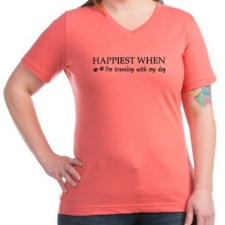 I don’t have pets so I have never ordered anything but when I see the website it is absolutely awesome. Didnt know so many products exists for cats! Hi, Sona. Yes, so many great and not so great products for our cats. Walking down the cat litter aisle can be very confusing if you don’t know what to look for and most importantly what to avoid. I think natural is ALWAYS best, especially when it comes to our pets. My good friend has a few cats and uses store bought litter – and it’s smelly. OK I need to tell my parents about this, they have a cat and are always trying to find a good cat litter, this one may be just right for them. Thanks, Sarah. I really appreciate that. And where I order, Chewy.com amazing company! 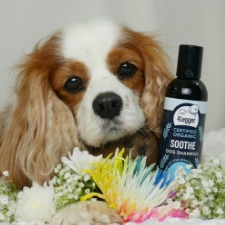 I think its difficult to find the right products for the natural growth of the pets. Some brands are just for their sales. Their results are very disappointing. I hope this is gonna give good results. You are so right Neha. And some brands try to act healthy and natural, but really aren’t. It can be a challenge to be a consumer. I have two cats and I’ve never used a traditional pine litter. 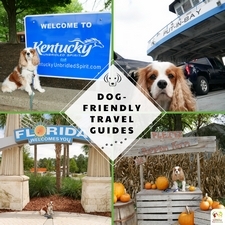 I really loved reading and learning about it and I’m thinking if it would be a nice choice for my fur babies. Thanks for the informative post! Thanks, Amanda. I highly recommend okocat. You can order directly from Chewy.com. I genuinely had no idea that clumping cat litter never degrades. I thought clay was dirt, lol! Who knew! 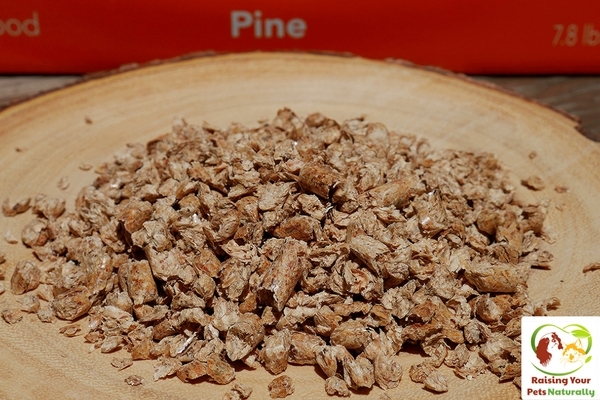 I can definitely see how pine would be safer and greener than regular cat litter. I like that this is dust free too! Yes! No gagging or coughing when filling, scooping or dumping Nutter’s litter. Not to mention when he shuffles in his box. Thanks, Alicia. You should check out okocat. Chewy.com sells it along with a ton of other pet products. We order from Chewy ALL the time. Wow! this cat litter seems amazing and natural. I don’t have cats so didn’t really know how cat litter even worked till I read your post there. 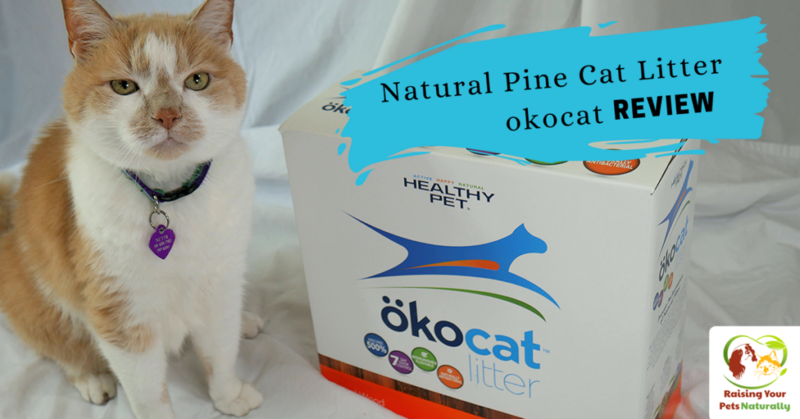 The pine cat litter from Okocat is a natural product and I am all about using as much of nature in our everyday lives as possible and that includes cat litter! What a great post. We have four cats of our own, although I haven’t thought about using natural kitty litter before. Mostly because once we tried to switch everybody over to a different litter, and there was protest! I’m not even kidding. They completely stopped using the litterbox all together and went on the basement floor right beside it. We quickly reverted back. Have you ever run across this, or are cats the pickiest creatures ever? Never have seen this brand before but I have seen a different natural kitty litter. I like this better than regular kitty litter because its decompose better. Very true. As much cat litter our kitties use, we need to think of the environment. Hmm, have you noticed any difference in your cat’s litter-throwing? Ours does quite the flinging of litter routine with every bathroom visit. If it could cut down on that, I’d be all for it! Oh. Litter box issues? Search my blog for litter box issues for some tips. Thanks, Ana. Unfortunately, most litters are toxic and people are unaware. I’m happy to educate and share great brands like okocat and online stores like Chewy.com. I am still not sure about pine litter, but with 8 cats (all rescues), it might be worth considering this or some other kind of natural litter. Price, performance, and ease of changing the multiple litter boxes will all be factors. Thanks for rescuing! Our kitties are also rescues. Give it a shot! I don’t have pets at home but this article is interesting to read . I don’t have any cats, but my mom sure does, and she is a fan of all-natural everything, as am I. I’ll be sure to share this with her! Nice review, will share with my cat owner friends. Is the free shipping deal for international customers also? Darn, no. I just checked. 🙁 Maybe in the future as Chewy.com continues to grow. This is great information. My niece got her dad a kitten for Father’s Day and I will be passing this information on! Thanks for sharing! So happy to share natural cat litter and Chewy.com! I haven’t bought litter for so long for a cat. But it does look like it’s a good thing. It’s important to get good biodegradable stuff. 🙂 Yes, the biodegradable is so nice for our environment. Ooh my friend has cats and struggles with their litter boxes too. I will send this article over to her and hopefully it will be something she can try. Thanks for sharing! If she is having litter box issues, she can also search my blog for other articles. I remember picking up something like this at my local store once. It was not bad but a tad pricey. My cat loved it. Sometimes paying for quality and environmentally healthy products can cost more. Unfortunately, it can be more costly to produce. Indeed. That is true and companies that make these items need to meet their overheads. Plus, they tend to be small businesses that can’t compete with the big corporations. I hear you! Our cats throw the litter out the box like they’re having a shower. Do the pellets cut down on this behaviour? hahaha Cat’s really can toss things around. I have noticed less tossing when I use a pellet like this. I love oko cat litter. My 2 cats really love it too. They’re a little older and it seems like an easier and milder litter for them. Your cat is precious by the way…lol. Glad to bring awareness. Our pets count on us to keep them safe. They only have us. I will have to try Okocat. I was actually alarmed when you wrote about the harmful effects of clay. I will check the litter bag and read what kind of stuff is in there. If there’s clay, I’ll ditch it immediately! Way to go to ditch the clay! I had no idea that cat litter could contain silica. I can see why you would want to try natural cat litter. Yes. Scary thought. Thanks, Marielle. who knew this was real and possible if i had not read it here, i have a few attachments to cats but never knew of this. thanks for the info as i will be on this from now on. My friend got a cat last month. 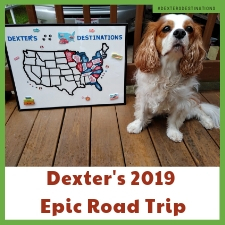 I will be sharing your post with her and she is going to love it! So sweet. Thank you for sharing. Getting them on the right track is important. This is very good information to know, I do not have cats myself, but have friends that do. Will past along this information, always good to go the natural route with things we use. Thank you for sharing! Thanks. Thank you for sharing too! I have been using a mango wood liter for my cats. would that be considered as a natural liter? it doesn’t comes with that branding though. Interesting. I’ve never heard of it. I would imagine it would boil down to how it is processed and if they add anything to it. I have tow cats. Can I use okocat litter?